Outside of the details of Aung San Suu Kyi's house arrest and the occasional broadsheet column inch dedicated to murmurings of up-risings against the military dictatorship which governed the nation, the goings-on in Myanmar (formerly Burma) were previously largely unknown to the outside world. In recent years, however, the secretive nation has begun to liberalise (and democratise) itself allowing for open elections to take place. Finally, we outsiders are being given a chance to look into the country too: Asia House Film Festival, with their screening of The Monk, present a rare chance for us to study the cinema of one of the most guarded countries on Earth. 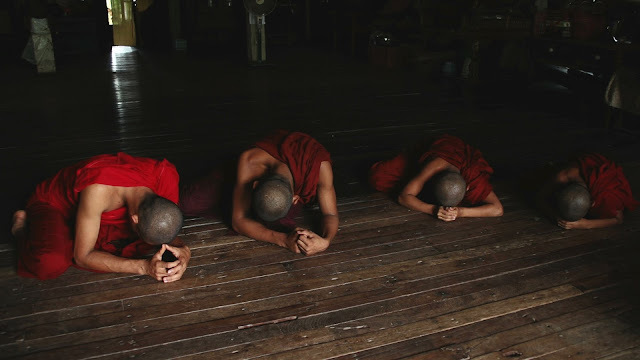 Directed by Burmese poet and film-maker Maw Naing, The Monk is a fascinating movie which looks at the role of Buddhism in a secular society and, in doing so, draws parallels between it's narrative and a nation looking to find an identity in a hyper-modern, gloablised world too. The feature presents us with a young monk, Zawana (Kyaw Nyi Thu), rescued from the streets as a boy and raised in a monastery in the Burmese countryside. His ailing superior, U Dahma, struggles to keep the institution open as financial burdens rain down upon it and Zawana begins to question his own faith; temptation arises in the form of one of the local girls. As the bright lights of Yangon, the appeal of MP3 players, and the lure of a potential suitor beckon him, the young monk is left with the decision as to whether or not to abandon his spiritual upbringing in favour of pursuing the pleasures of flesh and consumption. The imperatives of the physical, of the secular, battle against the sacred and divine. Clocking in at a succinct 90 minutes, The Monk is a movie which boasts a grand, national narrative told metonymically through a languid and intimate tale. Featuring documentary-esque aesthetics and a sense of realism in the way the camera frames the action, Naing's synecdoche feature sits comfortably alongside Asia House Film Festival's opening movie, Zhat, as a powerful state of the nation addresses. Zawana procrastinates on what to do as his life hits a fork in the road - as part of his past dies, the young monk's destiny opens up in front of him. Zawana is young, free and liberated just like Myanmar may be as it casts off the shackles of dictatorial military governance. The coming of age of man and of a nation, and perhaps of the Burmese film industry, are found in parallel in Naing's rewarding and poetic The Monk. The Monk makes its UK Premiere at Regent Street Cinema on February 28 2016. Tickets are available here.